Peak Oil proponents, and neo-Malthusians in general, tend to suffer from a serious methodological problem, one that has afflicted their analyses of resources for many years. With some justification, they point to the fact that petroleum (and other mineral resources) are extracted, not manufactured–as in “you have to find the oil before you can produce it.” This is a major part of the long-standing disagreement from some geologists who argue that economists believe higher prices ‘automatically’ translate into discoveries. There is some basic logic here: any number of automobile plants can be constructed anywhere, so you don’t need to predict the precise locations but can assume they will be built. Oil production can only occur in places where there is oil underground, and you can’t be sure that it will be there in advance. This attitude has been known to influence policy, usually detrimentally. The U.S. suffered natural gas shortages in the 1970s because price controls suppressed upstream investment and encouraged consumption. Similarly, British Gas, as the only legal buyer of supply from the U.K. North Sea, kept prices for domestic producers at a fraction of what it paid Norway for imported gas, arguing that higher prices for domestic producers couldn’t be guaranteed to provide new discoveries. In both cases, decontrol brought forth major new supplies. While it is true that the success of any given wildcat cannot be predicted, you can forecast that discoveries will continue to occur and that a certain percentage of exploratory wells will find oil. And where the resource base has a history of exploration, the confidence about discoveries grows, especially in terms of the success rate. 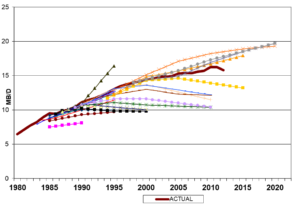 Actual find sizes fluctuate substantially (Figure 1), but a trend is usually discernible in a given basin. Even more, where there are existing reserves, more intense exploitation of them can generate reserve additions, which in a typical year account for the majority of ‘new’ resources. Source: UK Brown Books, data publication ceased in late 1990s. As I have noted for roughly three decades, nearly all forecasts for non-Middle East production have been too pessimistic since the early 1980s. Typical is to project a short-term increase, reaching a peak then declining. (Figure 2 is one example.) 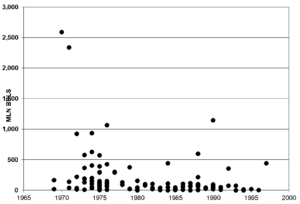 This appears to be a type of horizon effect, a bias set in by the concern about predicting future discoveries. You don’t know where oil will be found, so you are reluctant to predict that it will be. This is a problem that particularly plagues neo-Malthusians, but also conventional forecasters. Some argue that the uncertain probability of discoveries requires a conservative posture, but the reality is that assuming no discoveries in an area with a track record of finds is actually radical. 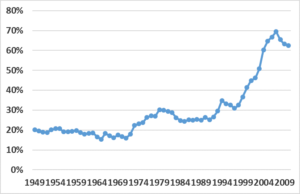 To observe a historical discovery rate, as in Fig. 3 for the United States and Figure 4 for Norway, and to assume that at any given point the discovery rate will drop to zero, is roughly the same as omitting discoveries altogether, which is nonsense. At the company level, Bijan Mossavar-Rahmani, an international oil and gas executive, once explained to me that most companies try to minimize risk and financial outlays by signing exploration contracts for new areas that commit them to as little work as possible, with the intention to continue drilling only if a discovery is made. Otherwise, they drop the sometimes very substantial and effectively untested acreage and go elsewhere. But his strategy was to recognize that an oil province will likely yield discoveries given enough time and effort. So the strategy was to continue to explore beyond the initial commitment until, hopefully, the code was cracked. Since the market had never experienced such a price increase before, there was no data to provide for an estimate, so the elasticity was assumed at 0.3, which meant a 300% increase in price would generate a 90% increase in production. b) factor costs soared with rising investment, especially in the United States. The top-down approach by many analysts tends to ignore the explanatory variables behind oil supply trends. 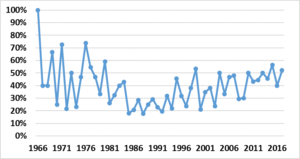 Peak-oil advocates like Colin Campbell, Jean Laherrere, Michael Smith and others merely extrapolate recent trends, especially if they are declining. Oil prices, fiscal regimes, and other factors that influence investment and supply trends are ignored, the assumption being that geology is the determining element and as such cannot be reversed, although trends change. 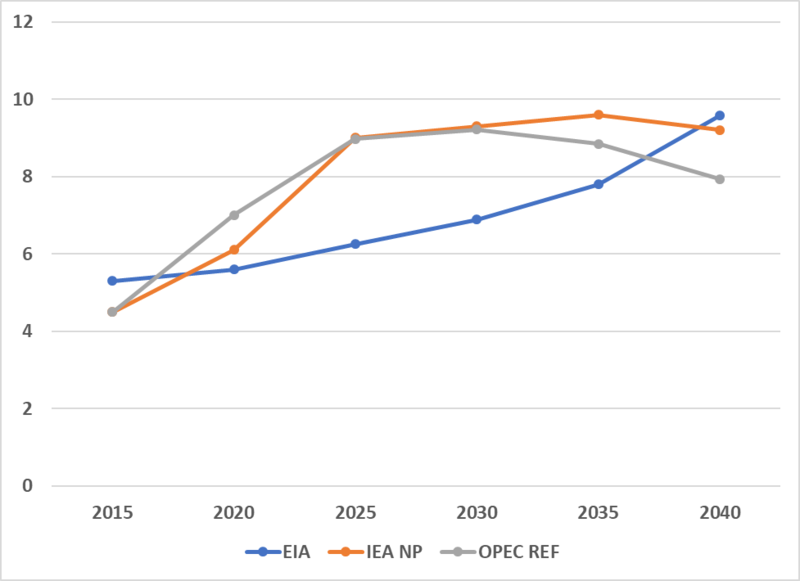 Obviously, analyzing these factors at the national level for dozens of oil producing countries is a task beyond nearly everyone, and predicting them in the long-term future for individual nations is virtually impossible. Supply forecasts that focus on aggregate regions can help to offset the problem, but since policy trends especially are not random, but not readily predictable, this approach remains imperfect. Still, avoiding the excessive pessimism that results from assuming discovery rates will drop to zero will improve forecast accuracy. Ultimately, the two salient points are that projecting supply is complex, especially since governments have a large say over whether or not investment occurs. The presumption that discoveries and supply cannot be assumed to occur beyond the visible time period, however, leads to a recurring pessimism. In a 1987 paper,  I noted that the major forecasts anticipated a near-term peak in non-OPEC, non-OECD production, despite the fact that the resource base was much less mature than in the OECD areas. A 1995 paper noted that even non-Gulf OPEC members, like Venezuela, were assumed to experience declining production over time, necessitating massive increases in supply from the Gulf countries, especially Saudi Arabia. How does this pessimism play out in current projections? Unfortunately, few groups provide national or regional forecasts, although the official forecasts often show regional breakdowns. Without delving into specific country or regional forecasts, Fig. 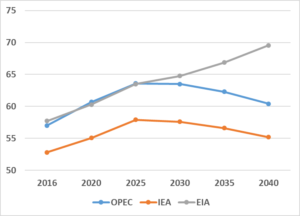 5 shows projections for non-OPEC production, and interestingly, the EIA sees continued growth while the IEA and OPEC have a peak and decline. 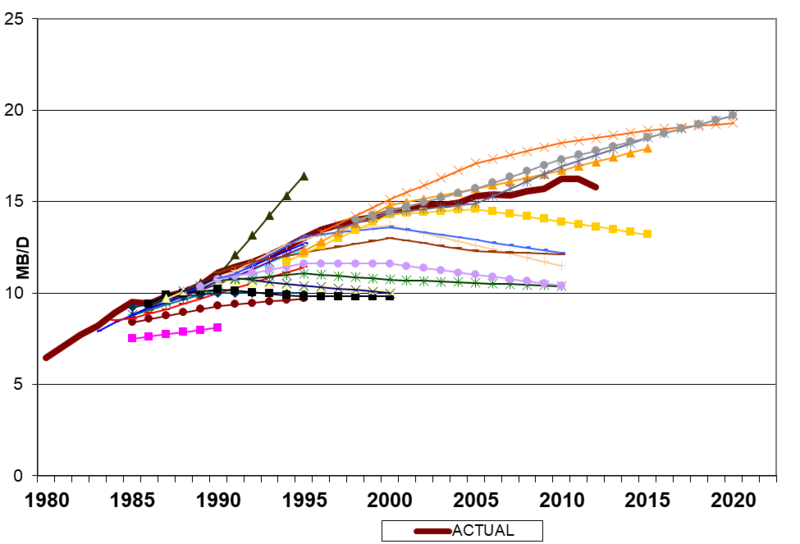 In part, the difference in expectations for shale oil (Fig. 6) explains the disparity, but only a small part. Ehrlich, Paul, Anne H. Ehrlich, and John P. Holdren, W. H. Freeman, 1977, p. 267. 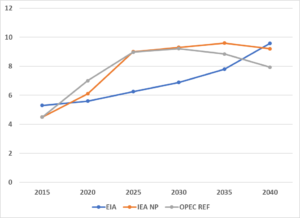 The post Predicting New Oil Field Discoveries: Institutional Realism over Simple Extrapolation appeared first on Master Resource.